We have been your #1 source for funny office awards long before Michael Scott handed out The Dundies on NBC's hit show, The Office. Of course, the list of awards Michael Scott handed out varied from boring (Pam won the "Whitest Sneakers Award") to the inappropriate (Kevin took home the "Don't Go in There After Me award"). Funny office awards - the funny office awards phenomenon started right here on LarryWeaver.com. I'm still touring the country hosting funny awards shows at offices across America. Funny office awards - 101 Funny Employee Awards is still the best source for highly funny and appropriate office coworker awards. 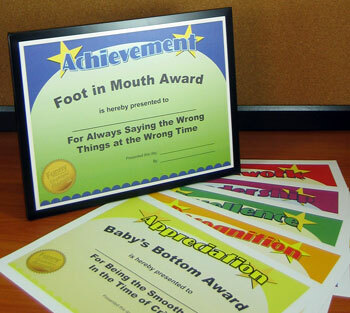 Funny office awards - click "office awards" at the bottom of the page to find a free printable certificate. Have your own ideas for funny office awards? Please post them in the comments section!